Archbishop Charles Chaput, center, accepts donations from the Knights of Columbus for the works of the Church in the Philadelphia Archdiocese Nov. 10. From left are Michael O’Connor, supreme director of the Knights in Pennsylvania; the Archbishop; George Koch, state deputy of the Knights; Rick Terroni, state secretary; and Auxiliary Bishop Timothy C. Senior. The Knights of Columbus in Pennsylvania recently made two significant donations as the result of fund-raising efforts by the Knights for needs in the Archdiocese of Philadelphia. 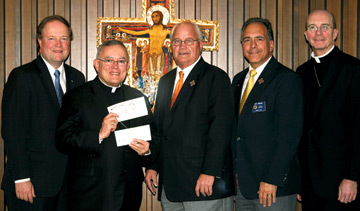 Archbishop Charles Chaput accepted two checks from the Knights Nov. 10 at the Archdiocesan Office Center. The first check for $5,313 assisted the archdiocesan priests’ retirement fund, while the second for $1,118 supported the promotion of vocations to the priesthood.